Is Migration a Factor in Mongolia’s Recent Steep Decline in Voter Turn Out? The recent parliamentary election produced a troubling result. Voter turn out dropped to its lowest level in 6 elections in the democratic era from a high of 96% in 1992 to 65% in this election. Turn out has declined in each election since 1992, but this year marked the steepest decline from a previous election with approximately 12% fewer voters going to the polls. I recently examined voter and population data in search of evidence that voter turn out has declined in part due to voters migrating out of registered districts to seek economic or educational opportunities without updating their registration in the new district. 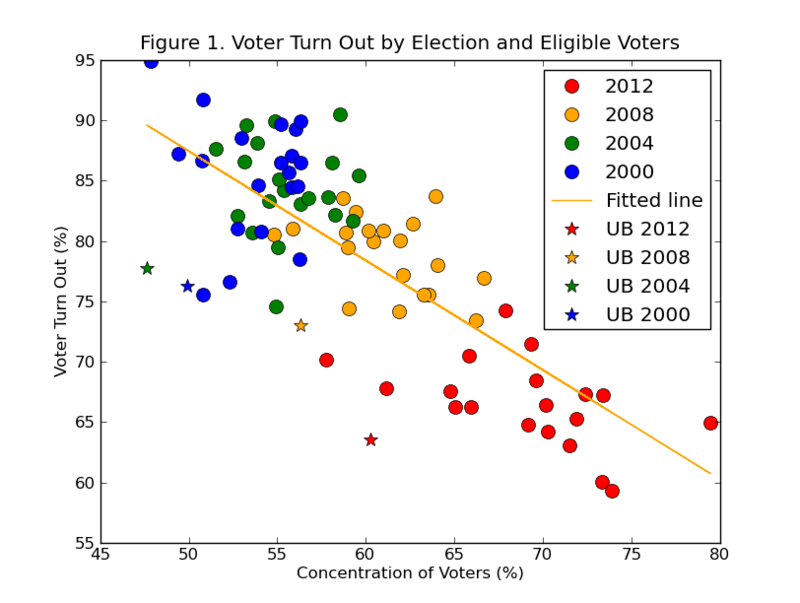 I discovered that the decline in voter turn out over the last decade has been strongly associated with an overall increase in the voting age population. I compiled voter data from the General Election Commission website for the 2000, 2004, and 2008 elections and voter data for the 2012 elections from media sources, as well as population data from the 2000 and 2010 national censuses, for 22 voting areas in Mongolia, which included 19 provinces and the special administrative areas of Ulaanbaatar, Orkhon, and Darkhan. 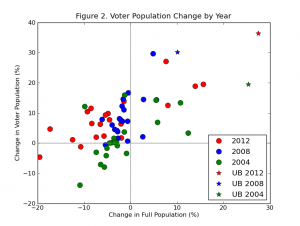 I constructed a simple formula for annual rate of population change in each area using the census data and estimated the populations in each area during the 2004, 2008, and 2012 elections. The most striking feature of the populations in these areas was the 15 percent decline on average in population in all but five areas in the decade between 2000 and 2010. Not surprisingly the population increases occurred in the economically booming areas of Ulaanbaatar, Orkhon, Darkhan, Umnugovi, and Dornogovi. In spite of this, the majority of areas with declining populations were still able to add to their voting age population in the last two elections. 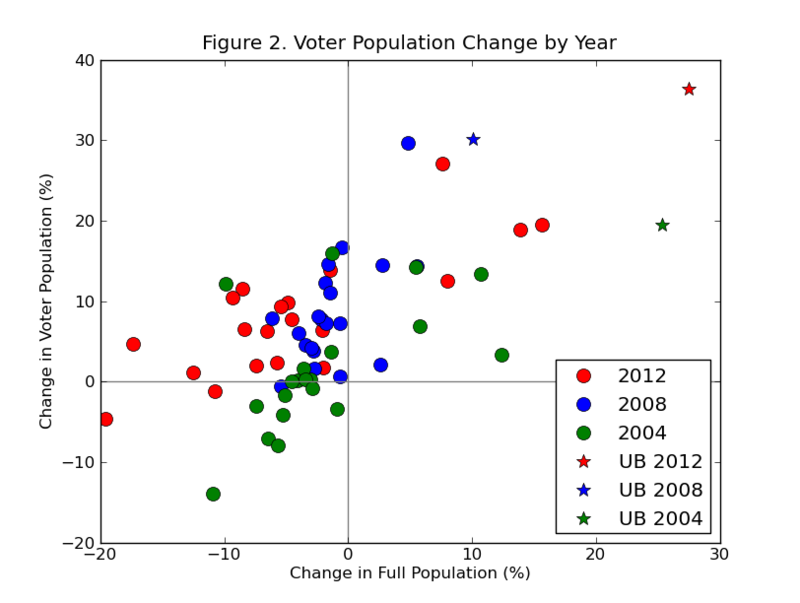 Figure 2 shows this for the 2004, 2008, and 2012 elections with the majority of areas with declines in their full populations from 2008 to 2012 having positive increases in the voting age populations (top left quadrant). This could be explained by more people turning 18 years old than leaving an area either by death or migration each year. Without additional data it’s difficult to calculate the different rates involved to see if the observed pattern is at least consistent with this explanation. Brian White has more than 6 years direct experience living and working in Mongolia, having first come to Mongolia in 2002 as a Peace Corps volunteer. He currently resides in Umnugovi Province. This entry was posted in Brian White, Democracy, Elections, Ikh Khural 2012, Party Politics, Politics, Social Issues and tagged Guest Post. Bookmark the permalink. Excellent work. 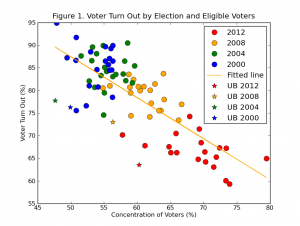 This is the first study I have seen on the significant drop on voting turnout in the June election. Great article. I know from personal experience that uni students in UB who come from the countryside rarely go back to their original provinces to vote, meaning that the people who vote in rural districts are predominantly older people. This, of course, benefits the MPP more than any other party. I’ve been searching all over the web but some data are in Mongolian, so cannot understand, really. You will find the most recent numbers for voting population in some of the reporting on the June parliamentary election. The next presidential election will be held next summer (2013) for a four-year term, the next election to replace the current parliament will be held in 2016 (also a four-year term). Note sure what you mean by “representative” elections. I’m skeptical that migration is causal – correlated, yes, but if the youth have the option to re-register in their new location, there is no need to travel to vote. So…why don’t they update their location? I’m interested in a response, if you have one. Have you looked into it further? Interesting and thought provoking, thanks! Yes, at this point there is only evidence of correlation, and it is misleading to claim causation without directly surveying the voting population and asking them why they did or did not vote. This analysis is just the first step in creating a hypothesis that a researcher with resources could actually test. It could be completely wrong. But, the point is that the data indicate something weird is going on, and a migration hypothesis cannot be rejected outright at this point. Maybe it is a statistical anomaly, maybe it is as the conventional wisdom states (without any data to back up the claim, I might add) that people have grown cynical about politics, maybe young voters are just being young voters and demonstrating a normal level of apathy, or maybe it is caused by a systemic problem exacerbated by migration or other demographic changes. At this point, we’re all just speculating. There are several anecdotal reasons why migrants would not re-register in their new location. For students, for example, it might be because their parents still live in their hometowns, and maintaining residency there is easier than switching to the new location. Students also move from year-to-year making hometown registration a more stable option. In the Gobi, and probably in other places, local residency gives people the right to land, special benefits such as mining royalty payouts, and in the case of Oyu Tolgoi preferential consideration in hiring. People vote a couple times every four years, but one’s residency can affect decision making in a one’s life multiple times per year. Calling your mother and asking her to get a document from the local soum government office, for example, is arguably easier than standing in line at a district office in Ulaanbaatar. I literally live next door to the governor of my soum, and getting government documents here is much easier than when living in Ulaanbaatar. These, of course, are all anecdotal reasons, and clearly some people re-register in their new districts. There are potentially many reasons for this, but one really important one is if a person has school aged children. In August Zuunii Medee (8/28/2012) reported on its front page the number of college students in Mongolia from 2004-2011. From 2004-2008 the overall student population grew by about 12,000 people to 60,387. From 2008 to 2011 it tripled in size to 182,103 people. These numbers are crazy. You have rural districts shrinking dramatically in population over the last decade, and yet year-to-year the voting age population continues to grow in those communities. Meanwhile this is all happening in a period in which Mongolia experienced a precipitous decline in voter turn out. Migration may not be the answer. Maybe it is that Mongolia is currently experiencing a boom in its 18-25 year old population which experience in other countries has shown to be a politically apathetic demographic. It may be apathy or it may be general cynicism. The issue I have with the cynicism and apathy arguments is that they are not based on any data or evidence, and it sort of absolves everyone of having to address the problem because it turns voter participation into a choice that people are not exercising. This is particularly troubling if it were to turn out that it was in part a systemic problem that is causing the decline and people would want to vote if the system facilitated meeting that desire. The verdict is still out. Hopefully someone with more resources than me will go out and test the several hypotheses this data suggests and settle more conclusively what is going on with Mongolia’s voter population.